BASRaT's Student Conference presents an outstanding range of speakers, a chance to network and to chat to Sport Rehabilitators. Presenting a stimulating keynote and excellent practical workshops, bringing your course to life and inspiring your future career. 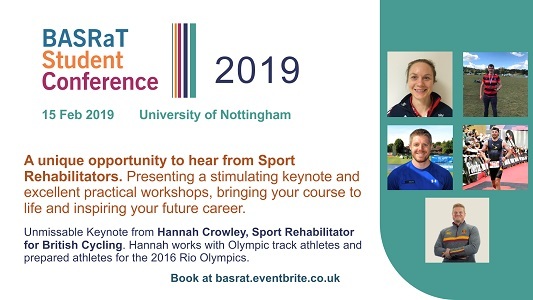 Taking place on Friday 16th February, the conference will feature an unmissable Keynote from Hannah Crowley, Sport Rehabilitator for British Cycling. Hannah works with Olympic track athletes and prepared athletes for the 2016 Rio Olympics. Click on the brochure below for full details.